LAS VEGAS — It was more of a private jet gathering than a GMC truck crowd. But former Massachusetts senator Scott Brown had an engagement, one he made before he entered the New Hampshire Senate race intent on rekindling his everyman image. He had agreed to a paid appearance before some of the wealthiest people on earth at the annual hedge fund confab at the Bellagio Hotel. In recent days, as anticipation grew about the political implication of Brown’s appearance, conference organizers took the unusual step of shifting Brown’s schedule to remove him from a panel that had drawn controversy on the campaign trail. Brown had initially been scheduled to speak Thursday, on a panel titled “American Beauty? Money, Power & Politics.” The other three panelists on the schedule were David Plouffe, Karl Rove, and James Carville. Brown’s staff acknowledged that he would be among those making money at the conference, but would not say how much he was being paid for his appearance. 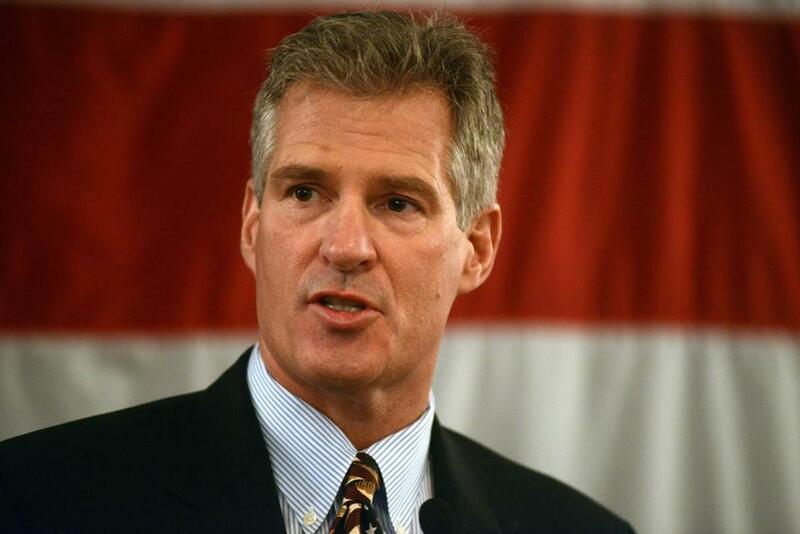 “Scott Brown is a speaker at a bipartisan conference along with [Democrats] . . . and he will receive an honorarium. It will be reported as required under the disclosure rules,” said Brown spokeswoman Lizzy Guyton. Money is the biggest attraction here at the SkyBridge Alternatives Conference, known as SALT. “Everyone here is in selling mode,” John Gibbons, a talent scout for Boston-based Highvista Strategies, which manages endowments, said after a panel Thursday. Indeed, Wednesday night found Brown and his wife, Gail Huff, sipping beer and wine at the conference’s poolside masquerade party. Amid glaring strobe lights, a winged woman dressed in a sequin top and bikini bottom played a see-through violin from a balcony perch. Later appearances included a fire eater, a French clown on a pogo stick, and can-can dancers. Brown, in a striped golf shirt and khakis, did not wear a mask. Nor did the former senator attract much notice. Brown’s campaign has tried to deflect attention from his appearance at the conference, which organizers said attracted more than 500 hedge fund managers among 1,800 finance professionals and investors. They said he would not agree to an interview while in Las Vegas. And even as he was here Wednesday night and planned to speak on Friday morning, the campaign sent out a press release statement on veterans affairs Thursday with a “Manchester” dateline, which could have been read as suggesting Brown was in New Hampshire. His spokeswoman did not respond to a request for an explanation. One man at the party who had an $8 million hedge fund said it was far too small and joked that he could get it to $80 million by week’s end. (Many of the fund managers here invest billions of dollars in assets.) Another who managed his own family’s wealth said he was on the lookout for some money managers to help out, then complained that the red wine being served at the party was surprisingly cheap. The Las Vegas appearance seems a world away from the campaign trail in New Hampshire, where Brown is staging a revival of his political strategy. He has been showcasing his famous green GMC truck, now with 300,000 miles, that has been an effective tool in his quest to show humility and common ground with working people. Brown has also been running races and showing up at small community events that demonstrate his command of retail politics, and his desire to insulate himself from carpetbagger charges. Senator Jeanne Shaheen, the New Hampshire Democrat who Brown is trying to unseat, released a statement this year that quoted her campaign as saying Brown “cares only about himself and the big corporate interests that fund his campaign.” She and other Democrats have long highlighted Brown’s ties to Wall Street. He received at least $2.7 million from the securities industry — more than any other member of Congress — during his 2012 campaign, according to the Center for Responsive Politics. Shaheen has collected at least $154,000 in campaign contributions from securities and investment interests since 2009, her seventh-largest category of donors, according to the center. After leaving office, Brown continued to show interest in the industry’s concerns, giving a talk at last year’s SALT conference titled “From Washington to Wall Street: The Impact of Overregulation on Hedge Funds.” Democrats as well as Republicans have participated in the event. Last year, for example, Barney Frank, the former Newton congressman, and Austan Goolsbee, former chairman of the Council of Economic Advisers for Obama, were among the Democratic speakers. While the Brown campaign declined to discuss the candidate’s payment for this year’s Las Vegas presentation, a spokesman said via e-mail that any story about the matter should note that Shaheen has also taken speaking fees, pointing to disclosure reports that show Shaheen gave five speeches in 2006 and 2007 for a total of $17,750. Brown’s office pointed out that Shaheen collected $5,000 for one of those speeches, from the Fannie Mae Foundation, which was closed in 2007 amid criticism that it used its tax-exempt donations to curry political favor. A spokeswoman for the New Hampshire Democratic Party said Shaheen’s speeches did not pose the same conflict of interest issue as Brown’s because she was not serving or campaigning for public office at the time.